Doyle Firefighters responded this afternoon at 1254 Hrs for a report of a structure fire on Peoria Ave.
Cheektowaga Police were on location reporting smoke showing and the 2nd alarm mutual aid was dispatched. 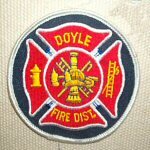 Doyle 2 9-1 went on location reporting a possible victim on the 2nd floor. Bellevue 9-2 reported heavy fire pushing through the roof. Command ordered all crews out of the building and ordered defensive operations. One victim passed away from the fire. Sloan, South Line, Rescue, Forks, Bellevue, Twin District (FAST), Seneca Hose, & Winchester responded as mutual aid to the scene. U-Crest & Union provided fill in companies.